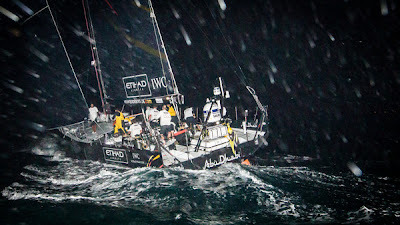 In a reshuffle of the leaderboard overnight, Telefónica (Iker Martínez/ESP) lost the lead to Ian Walker’s Abu Dhabi Ocean Racing on Leg 7 of the Volvo Ocean Race. 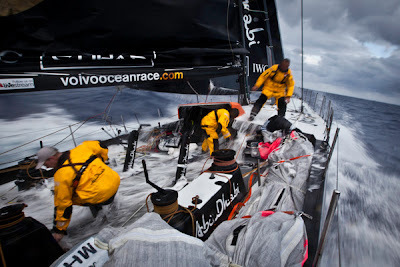 At 0100 GMT on Friday, Abu Dhabi took pole position when it became clear that the northerly course would pay as the six-boat fleet picked its way through the minefield of high pressure. Waiting on the other side is some exciting downwind sailing, more typical of North Atlantic conditions. 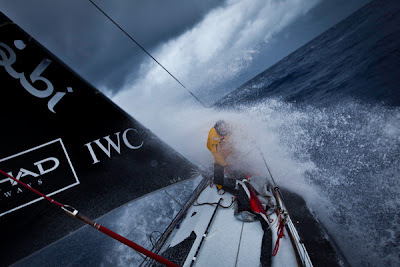 Walker’s lead may well be short-lived, as, at 0700 GMT CAMPER with Emirates Team New Zealand (Chris Nicholson/AUS) were just 0.9 nautical miles behind, pressing hard and sailing fractionally faster. 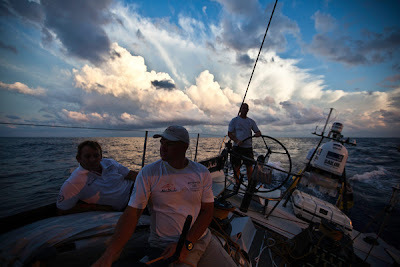 PUMA Ocean Racing powered by BERG (Ken Read/USA) were also putting up a fight and only 9.5 nm separated the top three. Hamish Hooper, Media Crew Member with CAMPER, reported that Abu Dhabi´s Azzam was in sight on the horizon in front and PUMA in sight astern. 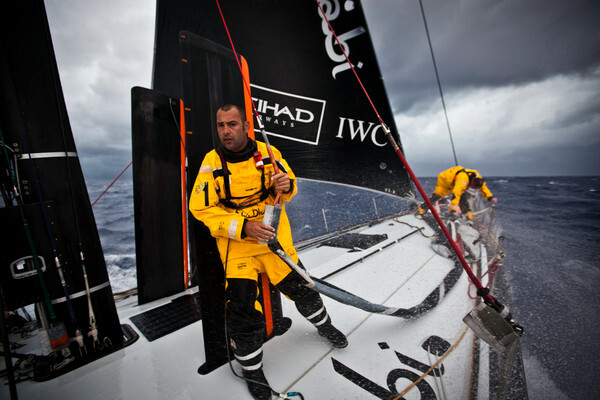 Further down the pack, the original stars of the leg, Telefónica and Groupama (Franck Cammas/FRA) were suffering. Telefónica have paid a high price for staying south longer than the competition and were 22.8 nm off the lead, making a miserable 9.8 knots. Groupama were a further eight nm back. In the north the leading trio are achieving 12-plus knots, assisted by the Gulf Stream, which CAMPER navigator Will Oxley described as an ‘amazing oceanographic feature’. According to Oxley, the Gulf Stream is continuing to play a key role in the leg. “Being on the right or wrong side of an eddy can mean a speed differential of four or five knots,” he said. 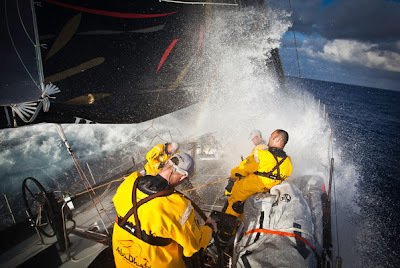 On board Groupama, the mood is improving as the wind fills in. After racing neck and neck with Telefónica for the lead, the team have slipped to fifth place but have now achieved their goal of re-joining the main pack, leaving Telefónica isolated and alone, and still 40 miles to the south. This morning, Groupama skipper Franck Cammas reported a flat sea, no waves and no water on deck. “We have the masthead code zero hoisted and the wind is increasing a bit – 10, 11, 12 knots now,” he said.